Steamforged are releasing spoilers at a crazy rate that’s a struggle to keep up with. Conditions are an important part of Guild Ball. They can have a massive impact on the game, and more than that, they’re part of our integral core design for several of our Guilds. The Butchers will bleed you, the Hunters want to snare you in their dangerous traps, and the Alchemists… oh boy, the Alchemists. They’ll poison your poor players, set them alight and burn them, and even bleed you if you’re not careful. These are just some of the obvious examples, but just about every single Guild has methods of inflicting one or more of Guild Ball’s condition effects upon their opponents, and then capitalising on it. As a coach, learning to deal out conditions and how to remove them from your own players is one of the first things you’ll learn once you pick up the basics! Of course, certain models interact more than others with conditions, whether by placing them on enemy models, or gaining benefits from interacting with enemy models who are suffering certain conditions. 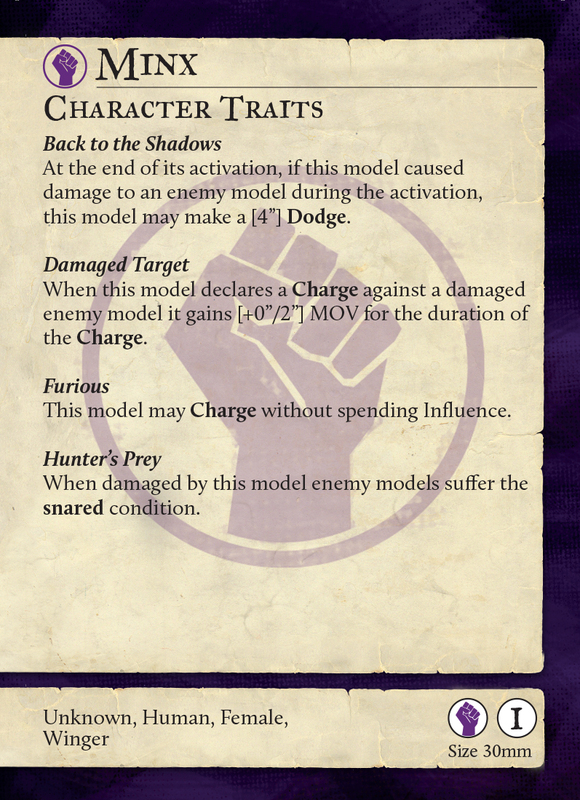 For this week’s Wednesday reveal, we’re going to focus on two models that have interactions with specific conditions. The first of these is a model we’ve heard a lot about recently, since she’s currently involved in the Civil War for control of the Butcher’s Guild – it’s the Flashing Blade herself, Fillet! Fillet is a model we’ve had interesting feedback on since she was released. 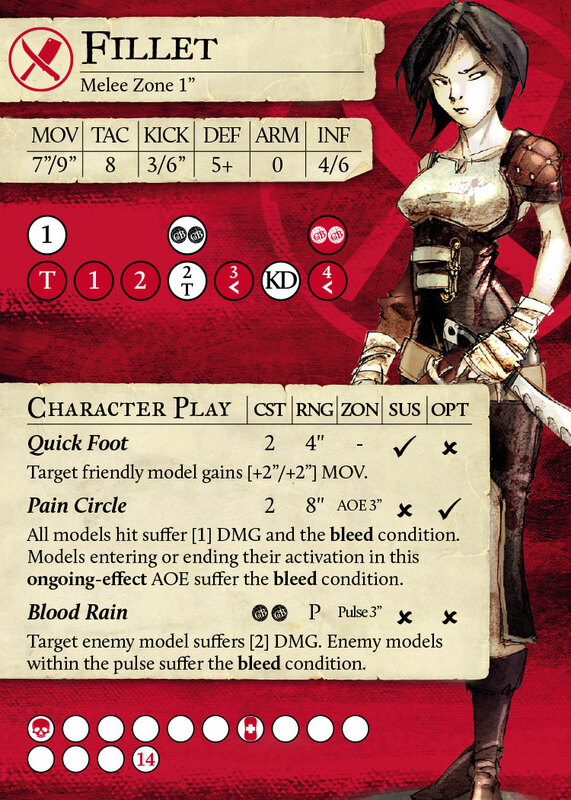 The queen of the bleed condition is a powerhouse of a player, able to score goals as well as murder the enemy team. With coaches throughout the Empire of the Free Cities all watching carefully, we knew that we’d need to be very careful when we approached making any changes going forward into Season 3, as she existed in an extremely delicate state of balance. Here’s the great news for those of you on #teamfillet – the front of her card is essentially unchanged. She’s still fast, still agile, and still has her base DEF of [5+]. We didn’t feel that any of those core values needed to change and were very accurate in representing the dangerous woman making her play for the Master Butcher’s throne. For the #teambrisket coaches, we’re sure that you’ll have noticed that Fillet lost a couple of points of HP, though, so she’s a little easier to take out at the end of her murder spree. Fillet coaches will need to weigh the risks of sending her off alone, shifting gears to work more closely with the rest of her team. Moving over to the back of Fillet’s card is where things start really changing. One subtle change is that Blood Dance has been amended to only trigger on Playbook damage results. Although the rule was functioning as we intended previously, we felt that her ability to get around Character Traits such as Unpredictable Movement via Pain Circle was a little too strong. Depending on other models’ positions, Fillet can still get to evasive players but Butcher coaches will have to think a little more carefully on how to do so. 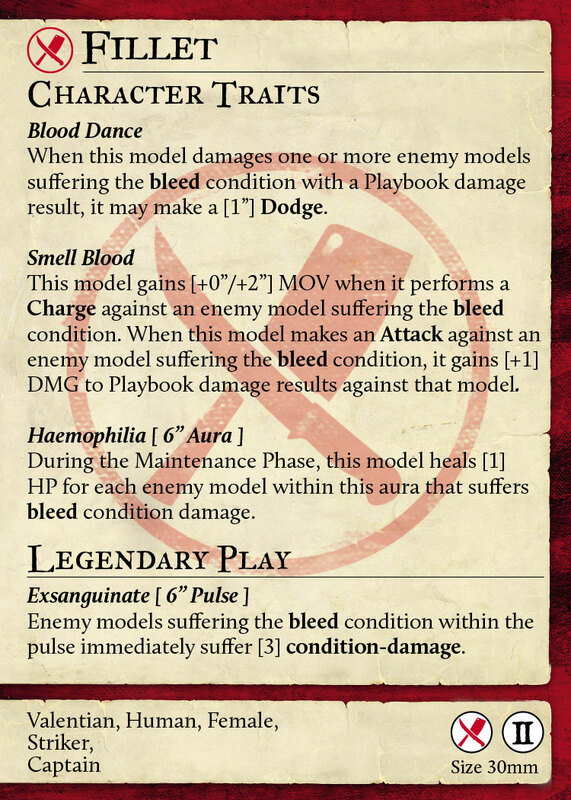 The next change is to Haemophilia, which now heals Fillet whenever an enemy model suffers the bleed condition within the aura. This actually pairs very nicely with Fillet’s reduced HP to give her a passive healing mechanic which can be triggered by other players – especially easy with Meathook or Boiler on the team. With Fillet’s natural DEF [5+], and access to Character plays such as Swift Stance to increase it further, the Flashing Blade remains a real headache for any opponent to take out. Whilst Fillet has seen some changes which will no doubt have coaches from all of the Guilds talking, we’re happy that going into Season 3 we’ve kept everything that makes her actually feel like a solid, fun character. We didn’t want to mess with the core design of the model, but we needed to very carefully look at what made the model strong, and the effect the model was having on the game at large. Small changes can be very effective, and a series of small changes can combine to have a big effect. By making the revisions we’ve seen here, we’ve kept Fillet as an extremely potent murder machine, capable of ruining her opponent’s day with absolute ease – #teamfillet for the Master Butcher’s throne! The next model we have to show you all today has changed much more dramatically than Fillet has. This is a model we’re particularly excited about, and we hope you all are too. We know Union Players haven’t been getting much love in terms of spoilers up until now, but that’s about to change! Enter the Feral Hunter, Minx! Minx is one of the players in Season 3 which has seen the most changes, with an amended Playbook, revised Character Traits, and Character Plays. Although her role out on the field remains as it was previously, she’s really come into her own in Season 3, and we’ve been able to draw out more of her character. Minx clearly has ties to the Hunter’s Guild, even if she’s not a full member – and now that she’s been freed (spoilers! Read the S2 background ;)), she’s perfectly poised to embrace that side of herself. This can be seen almost immediately by two of her new Character Traits, Back to the Shadows and Hunter’s Prey, both previously unique to the Hunter’s Guild. 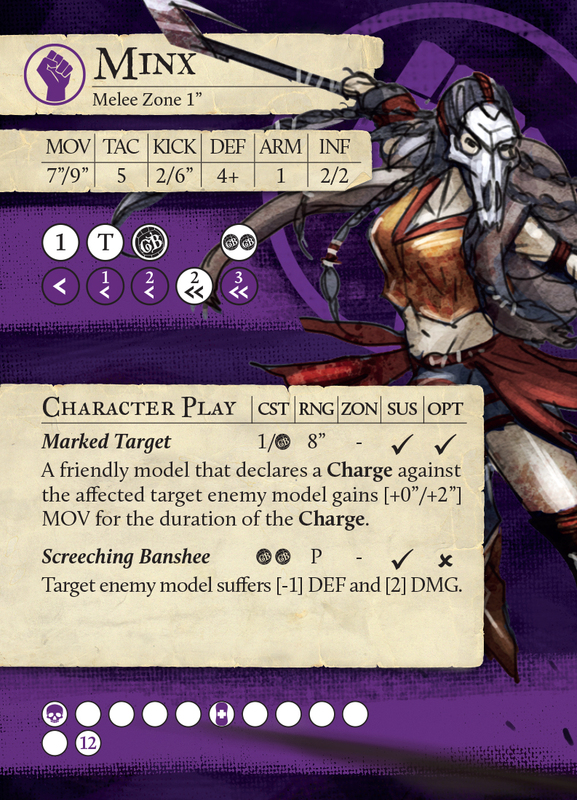 With Back to the Shadows, Minx has the ability, like Jaecar and Egret, to retreat away and make a [4”] Dodge at the end of her activation, provided she has damaged an enemy model. Not only does this fit in with her character, a dangerous huntress striking from out of nowhere before retreating to safety, but this grants her a huge amount of mobility, adding to her survivability by helping her get out of enemy threat ranges. But even more importantly, now, for the first time, several other Guilds have access to the snared condition! Hunter’s Prey gives Minx something important we wanted her to have, which is a utility outside of simply damaging enemy models. While inflicting damage on the enemy team is great, we wanted to give Minx some extra versatility that adds to her flavour as a huntress. Now, by applying snared, Minx helps to support her team, as well as making her better at hunting down the enemy herself! And if we look at the global change to Screeching Banshee, the bonuses from the snared condition quickly start to look even more deadly! [-1] DEF and  DMG, when combined with the extra [-1] DEF from snared is absolutely brutal! This leads us nicely to Minx’s Playbook, which includes numerous adjustments. The most important change is the dramatically increased amount of Dodge results, all easily accessible throughout the Playbook, and coupled with not only damage but also momentum generation – meaning that unless you specifically wanted that all-important tackle or Screeching Banshee result, then Minx will be dodging about the Pitch with virtually every attack she makes. Although Minx is now a damage dealer to be feared, with the capability of retreating back to safety after the damage is done, she does still only have 12 HP, making her an easier take-down for your opponent should they get to grips with her, so keep her safe on the flanks or in the shadows! She rewards the kind of Player with the patience and skill to wait for the right moment before pulling the trigger. A hunter, as it were. We’ve always tried to stamp the background of Guild Ball into model designs, and Minx is a perfect example of this design principle. Minx was freed by the Hunters in the Season 2 background, reducing her service to the Union, and enabling her to get more in touch with her roots. Finally, the last thing which we’re sure all you eagle eyed readers out there have noticed is the lack of the Selective rule… Don’t worry, that’s not a typo.